Eno Sarris already wrote about Adrian Beltre’s impact on the Texas Rangers’ offense. Due to the nature of fantasy scoring, Beltre’s individual defensive value will not result in points. Instead, the only way fantasy owners can reap the excellence of Beltre’s defense is to pick up the Rangers pitchers who seem most likely to benefit. The recipe for a pitcher who stands to gain from Beltre’s presence includes a pitcher who gives up plenty of balls to the left side. A large ratio of those balls should be of the groundball variety. While Beltre is sure to make a snag or two on a liner and track down a fly pop-up here and there, he’s going to make his living off scooping and firing grounders at a prolific rate. Using Baseball-Reference’s groundball-to-flyball ratio (which includes line drives as flyballs), it turns out that only three of the Rangers 2010 pitchers finished above the league average mark of 0.79. Oddly enough, each is a southpaw. Ageless set-up man Darren Oliver (0.90), swingman Matt Harrison (0.88), and starter C.J. Wilson (0.98) vary in fantasy value. There is no reason to ever own Harrison, Oliver is a nice get in leagues that value holds, and Wilson might be considered one of the better pitchers in the American League if he can continue the success he found in his first season of starting. Therefore, Wilson is going to get the attention here. In 2010, batters held a batting average of .090 against Wilson on balls hit inside the infield (well above the American League average of .078). Batters also managed a .206 batting average on groundballs hit against Wilson (AL average was .231) and .556 on bunts (AL average was .449). Since exact batted ball locations are unavailable, assumptions have to be made based on the infielders’ overall defensive value. FanGraphs’ UZR suggests that the only below-average defender on the Rangers infield last year was (then) third baseman Michael Young, with Ian Kinsler, Mitch Moreland, and Elvis Andrus rating as either average or above-average at their positions. That’s not to say UZR is perfect or that Young is responsible for Wilson’s mishaps on grounders per se. But it does indicate that in a vacuum, the Rangers defense should be improve, with Beltre the vacuum cleaner set to replace Young at third base. And that should help Wilson retain some of his strong 2010 value, which included a sparkling 3.35 ERA. The third base position is one of the more top-heavy in fantasy baseball this season. Alex Rodriguez, David Wright, and Evan Longoria lead the charge with B-Ranks (Bloomberg Sports’ proprietary fantasy ranking of all players) of 3rd, 14th, and 16th respectively. Those three should be off the board early, and shouldn’t be available after the mid-second round in standard 12-team mixed leagues. Seeing these players disappear quickly might make you rush to select a third basemen before you need to. Have no fear, here are a few third basemen who could present great value deeper into your draft. Adrian Beltre: The move to Boston and Fenway Park should be a boon for Beltre. Last season, playing 81 games in cavernous Safeco Field – a pitcher-friendly park that’s especially tough on right-handed power hitters – Beltre posted a home/road OPS split of .646/.717. Compare that with Fenway, where the only Red Sox player to have a lower OPS at home than on the road was Victor Martinez (minimum 200 AB). Joining a Red Sox offense that ranked in the top three in runs scored and OPS last season should also provide Beltre with ample opportunities to pad his offensive numbers. 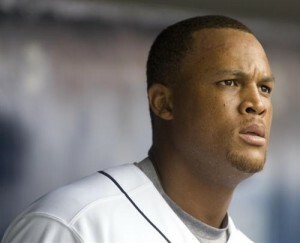 The 2009 season was the worst of Beltre’s career at the plate; a shoulder injury sapped his power, caused him to miss 30 games and hit just eight homers all season. If fully healthy, playing in Fenway and flanked by multiple good hitters, Beltre could easily approach his 2005-2008 numbers, when he averaged 25 home runs and 83 RBI a year. Ian Stewart: At just 24, Ian Stewart enjoyed a breakout year in his first full season, hitting 25 homers and driving in 70 runs in just 425 ABs. However, things could, and probably should, have been much better. Stewart’s batting average on balls in play (which is like regular batting average, only stripping strikeouts from the equation) was just .270 – 35 points below his career average. 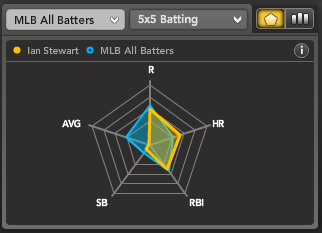 Stewart’s fantasy value is centered entirely around his power numbers, as you can see in his spider chart below. His BABIP should rebound, making him a cheap power source who won’t kill your batting average as he ascends to full-time duty. Troy Glaus: Selecting Glaus in the final few rounds of your draft is akin to buying a lottery ticket at 2 a.m.: Sure, it’s probably not going to work out, but what do you have to lose? If he is healthy, Glaus could very well put up 25-30 home runs and gain multi-positional eligibility. It’s staying healthy that’s the issue, with shoulder, oblique, and back issues keeping him out of the lineup for all but 29 ABs in 2009. Over his career Gluas has proved himself to be one of the more consistent hitters in baseball, posting walk rates in the 13% range and never having an OBP below .350 since 2003. Currently Glaus has a B-Rank of 419 and a positional ranking of 34th, which slots him behind players like Jose Bautista and Alberto Callaspo. That makes him a bench pick in most drafts. If Glaus can stay healthy for even 110-120 games this season he should put up useful power numbers that can help you in deep leagues, and provide insurance against an injured corner infield starter in shallower leagues. If he can’t avoid the DL, a 28th-round pick is no big loss. For more information on Adrian Beltre, Ian Stewart, Troy Glaus and hundreds of other players check out Bloomberg Sports’ fantasy tools.